As a blogger or a writer, it’s really nice to see people taking the time to comment on your post. It’s a good feeling to know that your post benefits them or it’s appealing. Today, I’d like to introduce a reader who has been following my recipes like the one above, tried them & took time to post lovely comments, gave credits & even shared them. This incredible lady is none other than Amy Jow! Nope, Amy isn’t a blogger but a school teacher. She’s in charge of Golf @ Naval Base Primary School. Guess what, Amy was Jonathan’s golf teacher while he was in elementary school! 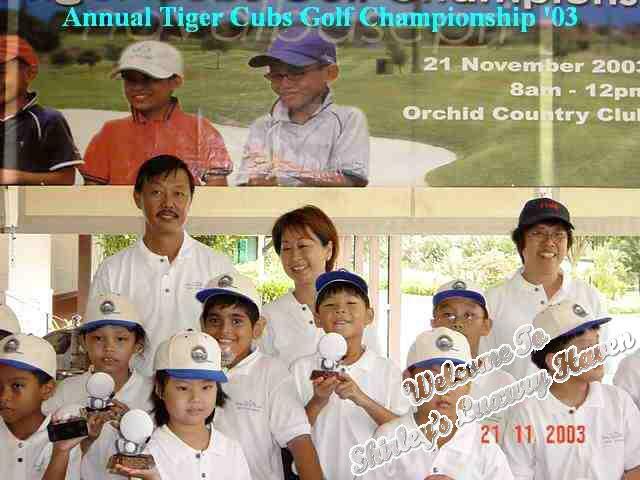 This pix was taken in 2003 during an annual Tiger Cubs Golf Championship at a country club. That’s Amy with her cheerful smile standing in the middle. Standing just in front of her is Jon, holding on to his trophy. This is Amy Jow, Jonathan's golf teacher @ navalbaseprimary. Remember me? I love reading whatever you put on this wonderful blog of yours =) Good job!" Since then, she went on to try my other recipes like those below; often coming back with nice feedback, giving credits & sharing them with her friends. I must say that not many people bother to do that & I appreciate her kind gestures. Recipe from What do You Do With That Unfinished Bottle Of Wine? Well, what do you think of her cooking! Superb, isn't it? I think she did a great job & her food looks yummy! Thank you Amy, you always make my day with your feedback! Hope you'll share more of your comments here with other readers. You make me SMILE! Yes its great to have friends like that! Thats the best part of blogging! Shirley, I'm sorry that I didn't spend enough time on your site! hahaha.... Don't be sad. I have very limited time to scroll around daily. So, need to take turns to visit all of you since time concerned. I hope I can share my time equally and fair to all. So, please be patient with me. :o) You're always on my thought. Sometimes I can't help but think that blogging pulls you closer to people you never would've thought you'd be so close to. It helps open doors to beautiful friendships. I know I've found a few through blogging. So glad Amy found your blog! This is such a small small world! Believe it or not, Naval Base was my pimary school too. It's my first local school that I've attended when I first moved to Singapore. I spent some years there. I think the name Amy Jow sounds really familiar. I wonder if she taught me before too!! You can receive if you don't give and this is how the blogging world works too. PPl appreciate even only two words comments on their blog. 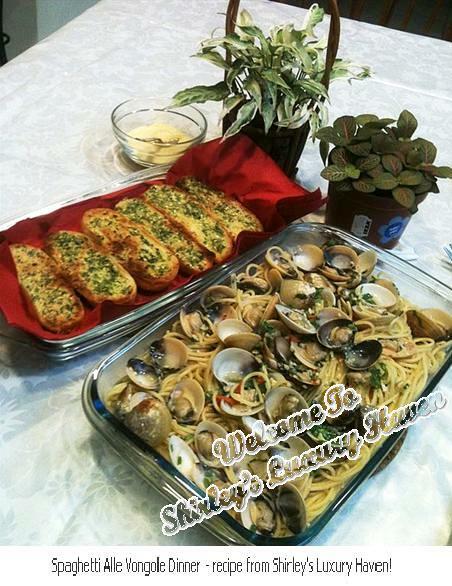 By the way, she is a good cook just like you and seems like both of you cook similar type of food. Its readers that takes time to post that makes my day! You're lucky to have such a wonderful reader! Ken, I'm sure u can too with all the pix instructions :) Thks for visiting! Shirley, great meeting u too! Kristy, always like your humour :) Have a great vacation! Lequan, couldn't agree more :) Glad I found u too! Nava, thks for the lovely comments! Have a good weekend! Alisha, I think she did a fantastic job! Friendship is an amazing thing & I'm glad I started this blog. U're always too kind with your comments. OMG, u really ordered Choya? Didn't think u'll try out my concoction. Thks so much! Can't wait, my dear! hey there, thanks for the follow! :) i've also followed you back! Seems that I have made quite a few friends through this wonderful blog of Shirley's. Apologies for this late 'appearance' as i have problems posting on a few occasions. The pleasure is mine to be re-united with Shirley. Shirley, has Jon managed to find time to still play golf? It has been fun 'stalking' her. I must share that her blog is one that I must visit whenever I log onto the internet. I have got many wonderful recipes from it and I must say that I have received many WOWs and OOHs from the dishes I borrowed or adapted. The recent ones were the Beer Battered Prawns and the BBQ White Wine Clams. The cooking of the clams over the fire got everyone excited and all were standing by waiting for the clams to be cooked. For a moment, I was hoping someone could video me...hehe. It was a WINNER!!! The prawns served as a appetiser/prelude before the BBQ food was cooked. They were snapped up in no time. The other favourite of mine is the Kueh Pie Tee inspired by her Basil Leaves Minced Meat. I went for the traditional Dried Shrimp Turnip version and I have been finding occasions to make it since the first time I tried. 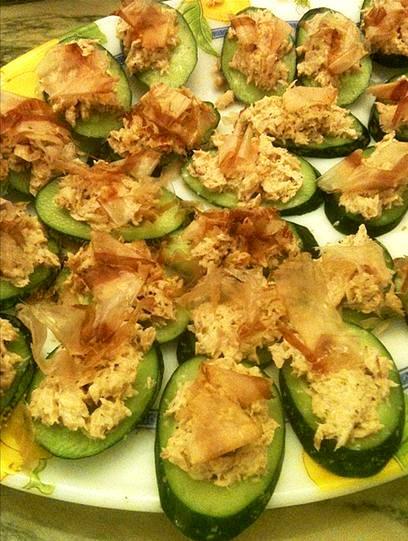 It makes a fantastic party food to go with drinks. It's nice to hear that you were from Naval Base Primary too. which CCA were you in and which year were you there? I heard somewhere somebody is cooking something with Choya? I have half a bottle at home ;) Please share! Amy, so sorry for the glitch & thks so much for your lovely comments. I'm so glad u found me, Amy! 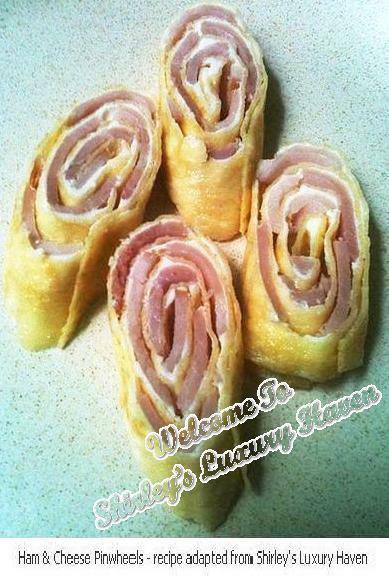 I'm delighted my recipes turned out well for u. Talking about video.... I've just been invited by SingHealth to do a video shoot on my Winning Recipe. Hahaha! Well, the Choya recipe is one I'd created for The Cocktail Challenge! Would love the idea of u trying it out too since u it's not avail anywhere else in the world! Shirley, I can already tell I'm going to have fun catching up on your past posts -- such a lovely variety of ideas -- and you make your readers feel special, too. I look forward to more of your food and friendship!